Running The Gauntlet, RV Style!!! You know how uncomfortable it is to drive your BIG motorhome in the dark??? You know how uncomfortable it is to drive your BIG motorhome in bumper to bumper traffic??? Well add to that rain coming down in buckets so you can't see the road for three hours of driving!!! I call that running the gauntlet ... requiring several aspirin and a hot tub upon arrival ... except I didn't have either. Here's the story ... I'm going to Sacramento for a three day Christmas. My friend Ofie is going to Elk Grove for a three day Christmas. Since I'm going right through Elk Grove, she should go with me ... I'll drop her off and pick her up on the return trip. I'm driving the toad, since I already picked up the RV from the repair shop and left it at my friend Cyndae's house so I have a place to sleep at Christmas. The first inkling of a problem ... Ofie's brother lives on Hwy 99 and I only drive I-5 (wider lanes and more of them). After a quick GPS search, I let her off on the 99 side, keeping an eye out for where to turn around when I pick her up for the return trip in the motorhome, down I-5. After another hour of foggy driving, I arrive at my destination ... Dixon ... for a wonderful Christmas!! Two seconds in the door and Cooper made a beeline for the fireplace. Seems there were doggie treats under the tree ... worse than a five year old ... he tore into them and downed a couple before I could stop him. Finally Cyndae broke into the rest of the "doggie" packages!! This is Mom Michelle on the left, Grandma Cyndae in the middle, Auntie Rebecca on the right and Miss Lizzy admiring her new snuggly soft coat. Traffic was bumper to bumper the second I got on the freeway. The good news was that my windshield wipers worked really well and I could see to drive ... kinda ... couldn't see the road from all the water spray, but I could see the tops of the cars in front of me!!! Just out of Sacramento, the traffic eased up but the rain didn't. Thankfully 99% of the truckers stayed home and weren't on the road. It was just me and 9,000 cars!! I found Ofie and we headed out for home at 4:00. Slow driving turned out to be 45 or so. The wind gusts were pushing on me pretty hard ... and with so much traffic around, I was afraid I might hit someone. By Stockton, it was dark dark dark and still pouring rain!!!! Sure could have used a few spotlights on the front to illuminate the road. Had I not traveled this freeway many many times, I would have just pulled over and spent the night. Finally, with a big sign of relief (I think Ofie's hands were cramping from hanging on) we took the last exit to my house. WE MADE IT!!!! Ofie said I was very "brave" to drive this big thing. I don't know about that, but this trip definitely got my heart rate up. I think I lost a couple pounds from the stress!! There have been some big storms cruising through California this last few days and they have resulted in the opening of Dodge Ridge Ski Area ... one of my favorites. Being a long time season ticket holder here, I was VERY happy to see it open BEFORE Christmas. This privately owned resort doesn't usually open until the following year due to the shortage of snow. I must say, there was no shortage yesterday!!! My ski buddy Peter Treso and his daughter Loren, called to say they were ready to hit the slopes. Despite the pouring rain here we took off early yesterday morning, hoping it was cold enough to snow in the Sierra Nevada mountains. We just started to see snow at Long Barn and by the time we got to Pinecrest, we were wondering where all the snow plows were!! With no waiting in line, we had our passes and were on the slopes in minutes. So much nice powder ... my skis stuck to the snow like glue ... I wasn't going anywhere. With no notice, I hadn't had time to get wax put on the bottoms ... a quick trip to the repair shop, $15 and 15 minutes had me back out on the slopes just sliding along nicely!!! The good part about it snowing a LOT is that most people stay home and we have the place to ourselves. We were not disappointed!!! Within an hour however, whiteout conditions persisted. We could barely see the lift chair in front of us, let alone anyone laying on the slopes ... and there were lots of those obstacles!!! Better to hit the road for home ... it's snowing more and more ... and we DO want to be able to get out. Good thing we left when we did. Peter's car DOES have 4-wheel drive, but it wasn't helping. 45 minutes of tough digging on our hands and knees, and Peter pushing while I drove, FINALLY resulted in us getting out of the parking lot. Poor Loren thought we were going to spend the night!!! Still no snow plows in sight, we headed rather blindly down the road. Not much visibility here!! Two years ago, we were driving down this same hill when someone hit the brakes, resulting in a 3 car pileup ... thankfully we were able to stop in time because Peter was driving slowly. On THIS road this day, he was also driving very slowly and carefully. Of course the big macho guy in his macho truck wasn't happy with that at all. No Brains was trying to show off to his girlfriend and the rest of the cars following us. He passed us on the left when we stopped at a stop sign. Dummy had no weight in the back of his truck, gunned it too hard, turned it too hard and slid right off the side of the road down the slope into a tree. We laughed and waved as we went by him headed down the road. Guess he made a great impression on his girlfriend!!! Wish I could have gotten a picture!!! Finally we came up behind a grader plowing the road. By this time there was at least 6 inches of snow in the road. Nice guy that he was, he pulled over for traffic since he was barely going 5 mph ... letting us all slug through the deep snow!! Further down at Sierra Village, the State snow plows were hitting the roads hard, making driving much easier and a little faster. The snow let up a little so visibility got better. Almost down the hill at Confidence, there is still lots of snow. There was NONE here when we came though 5 hours earlier. At the lower end of Twain Harte, the snow finally turned into rain. A great day of skiing with best friends and lots of snow adventures. Me too .... guess the world isn't going to end today... at least it hasn't yet. Maybe I shouldn't be speaking so soon. However, since we don't have a calendar any more, I chose to make one for myself. It has 3 Saturdays, 3 Sundays (good TV days) and one Wednesday for the garbage collector. NO Mondays in my week any more!!!! Being a single woman, things like maintenance and upkeep on vehicles (and homes) can become a problem. Someone (a guy) needs to write a short "maintenance" list for us women who travel. If I knew what needed to be done when, I might be able to do some of the work myself. At least I would know when to have the work done in order to have fun and safe trips with no worries. That said ... my RV mentor told me to have the oil changed in my diesel pusher at about the 6,000 mile mark, and that I should occasionally start the engine and run the generator under power. I'm getting ready for a month long trip back to Southern California/Arizona, so have been checking tire pressure, running the generator, just generally making sure things work. Start Generator: It's been cold here, so it took a little while to get it going, but it worked great. I turned on both heater/ac units and let them run. Everything is good. Camera Check: Back works great ... left works great ... right is black. 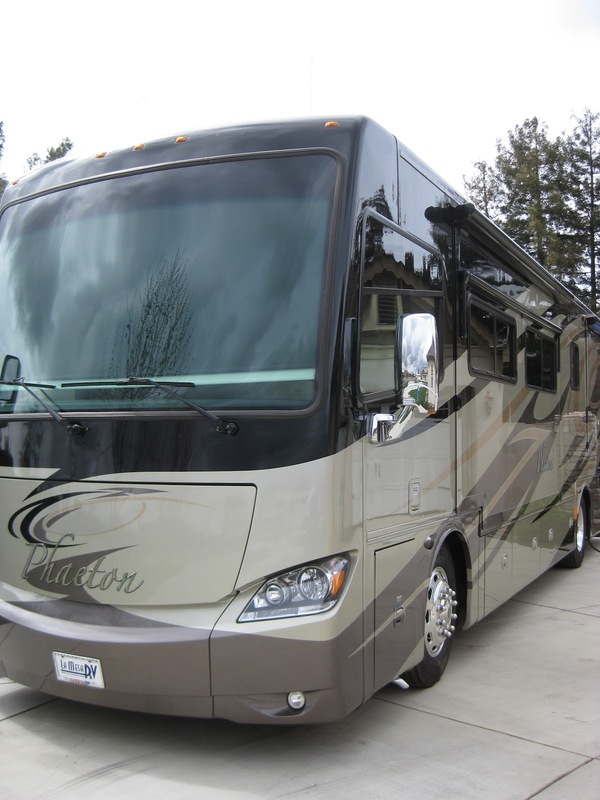 I'm at 6,000 miles, so time to make an appointment at La Mesa RV in Davis, California. That done (two weeks ago) I drove up to Davis Tuesday. On the way I discovered the CD player is locked up. Add that to the list. For the third time in three visits, I have a new service manager. Seems they don't last longer than 3 or 4 months. That's kinda scary!!!! "When do you need it back Ms Kissack?" This Saturday please. "Well we are closed Saturday and won't be able to get parts for the camera or the CD player for at least two weeks. The plants back East close down for Christmas." REALLY??? Why didn't someone tell me that when I made the appointment?? Good news is that after two days, they called to say the camera had just come unplugged. They fixed that and "taped the heck out of it" in the hopes it wouldn't happen again. "The CD player is trashed and we will order another one". Hmmm not very professional. The bad news is that the oil change is costing me a cool $300. Does that sound right to you??? I have no idea how often to change the oil now ... hoping it's not too often ... I'll definitely be cutting down on my grocery and heating bills!!! So maybe one of the long time RVguys will write up a small list of all the things to check and maintenance required in order to keep us woman on the road. I know we have a reputation for bad driving and maybe you would rather we NOT be out there. But trust me, it's better to have us out there in safe RV's that have regular maintenance, than going 25mph down the freeway possibly causing an accident cuz we "think" somethings wrong ... or parked on the side of the road desperately flagging you down. Thanks in advance ... it is greatly appreciated!!! Okay, enough with the climbing pictures. But WAIT!! It was a milestone for me!! I CLIMBED A 5.10a WALL ... TO THE VERY TOP!!!! 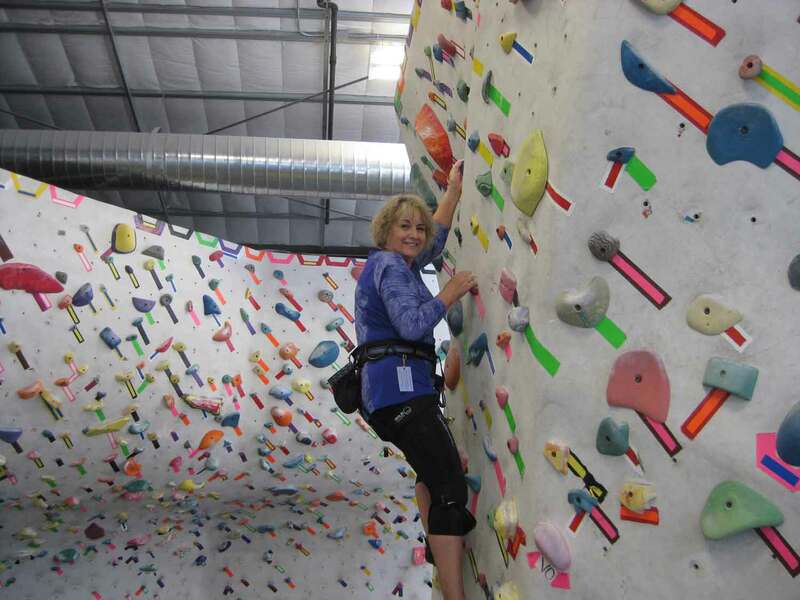 A midweek escape landed us at Metalmark Climbing Gym in Fresno. 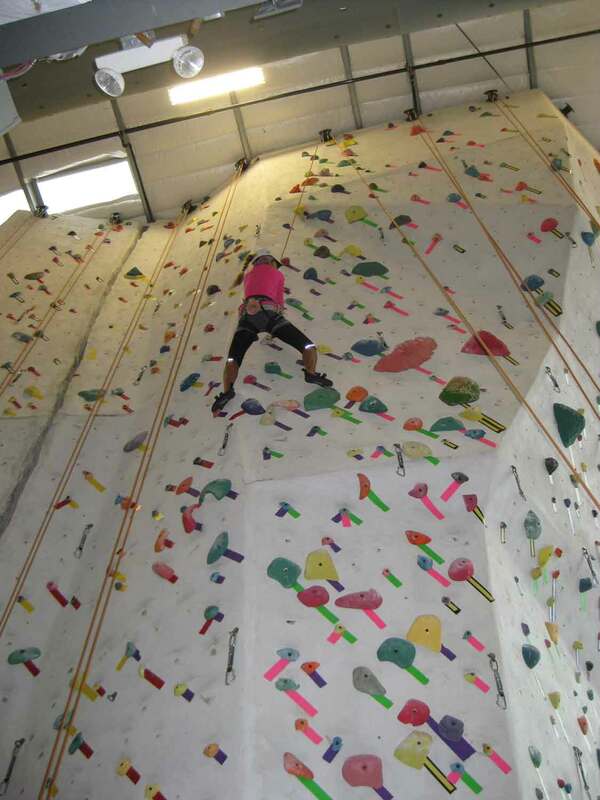 Three of us including Ofelia and her daughter Nina, took off mid morning in the pouring rain for some great climbing. Being a Wednesday, there was no one there ... just two guys changing some of the routes. After almost four hours of climbing, we virtually had the place to ourselves. I'm tying on to my harness, getting to climb ... Ofelia is attaching the other end to her belay device so she can stop my fall should the need arise. Luckily that hasn't happened to me ....... yet!!! After warming up on a 5.9 (really? 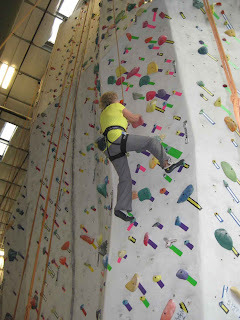 I always warmed up on a 5.6!!) they insisted I try a 5.10a. Okie dokie ... here I go!! Pretty tough at the top, I actually completed this climb. I was sooo excited!!! 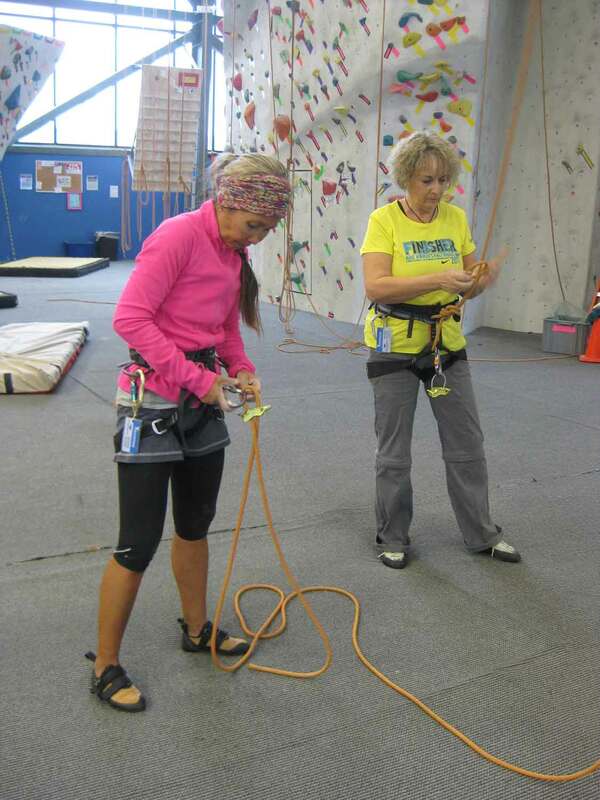 Here's Nina tying in getting ready to climb. Safety is a big thing ... everyone checks everyone elses "connections". And Nina put us all to shame and climbed a 5.10d. Course it helps that she is half our age and a great outdoor climber along with her fiance Ryan. You can see in the above image and in this one, just how awkward some of the positions are that you have to get in, in order to make the climb. Half the problem is figuring out which holds go with your route ... and how to get to them!! From here we moved to another wall for a different climb! Amazingly enough I completed another 5.10a climb!! I was hooting and hollering after this one. Now I can call myself a 5.10 climber!!! Almost!!! Just a tad shy!!! Just 3 more holds!!! More climbing with Ofelia. It's such a good feeling to face a physical challenge and beat it!!! 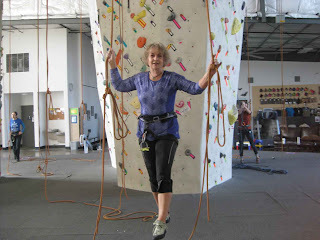 I've never climbed the hard routes before, being rather intimidated by Ofelia's feats. It's easy to just say "no, that's too hard, let me down". 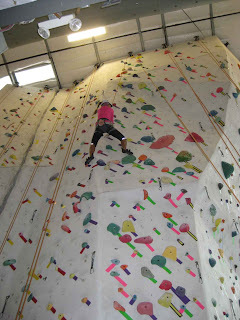 I watched her climb the 5.10c wall with some trouble, but she did it. That motivated me to try harder. The good news is that the more you climb, the stronger you get (at a pretty fast pace) so the harder you can climb!!! I did only 5.9 walls this time and finally decided to tackle a 5.10a. The hand and foot holds are smaller and farther apart, plus they are in more awkward positions. 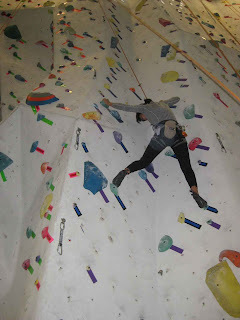 On the second try I got to the last overhang and I couldn't quite hang on with one hand and reach far enough with the other. My forearms felt like they would explode!! Next time for sure!!!! Taking a break, we decided to play with the balance strap. 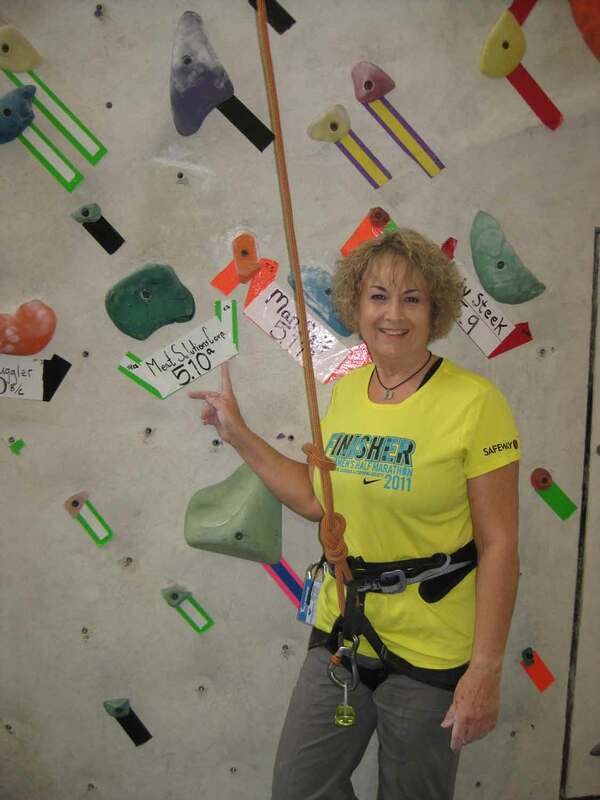 This picture looks like I am standing on the carpet, but I'm perched on a one inch wide strap 4 feet above the floor ... hence the ropes I'm hanging on to for dear life!!! 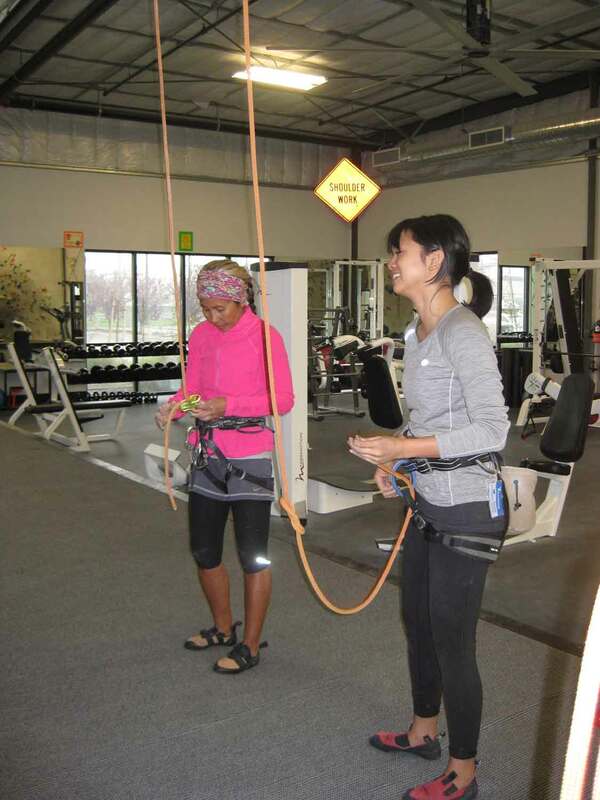 It's a tightrope walk and really good for balance training. If you fall, it's ok ... that carpet is actually a cushy 12" thick mattress and spring setup so you won't get hurt. 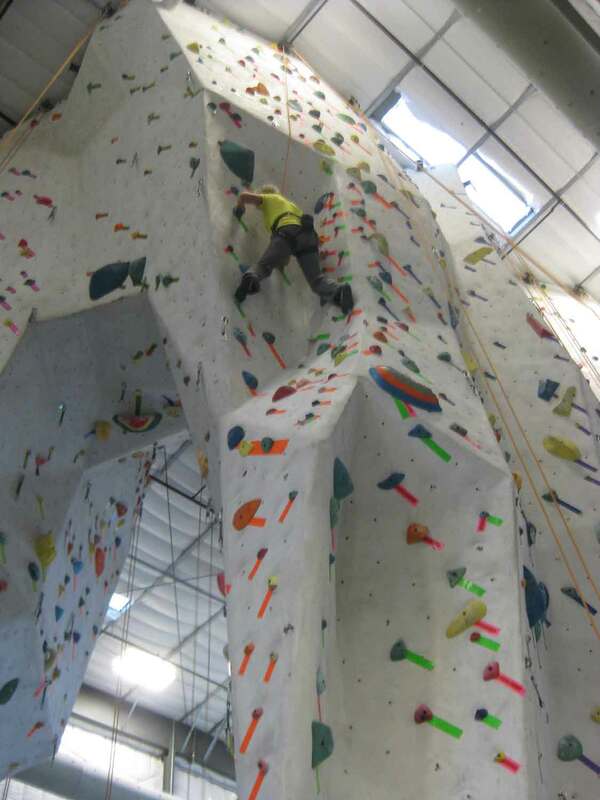 The other part of the gym is for bouldering. 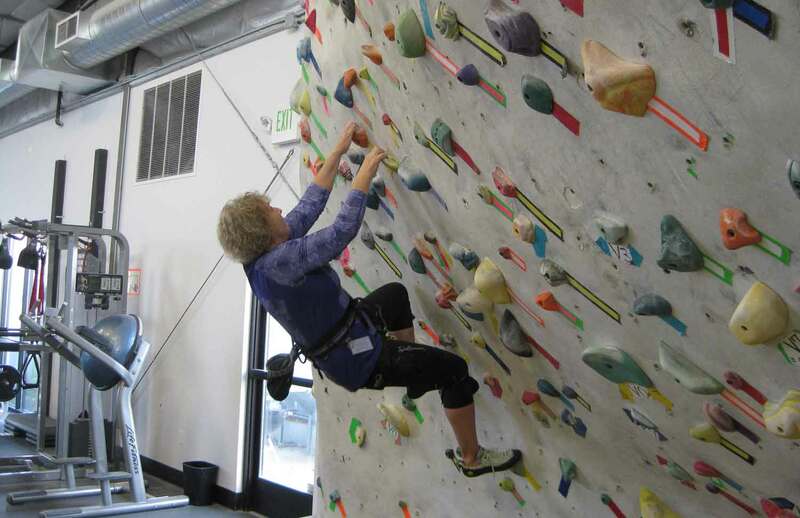 These walls are extreme overhangs about 25 feet tall. You free climb ... meaning you are not attached by a rope. 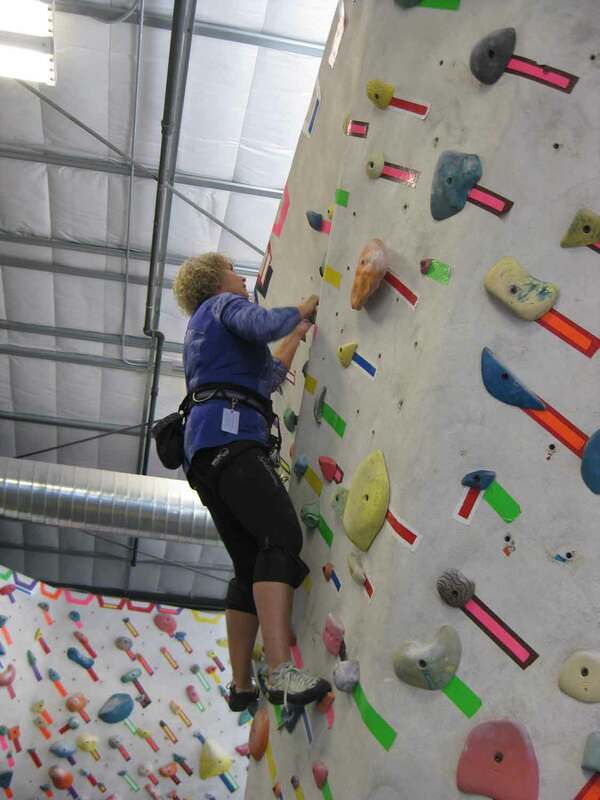 As extra precaution, there are additional mattresses that you position beneath the climb you are doing. These range from V0 to V15 ... easy to oh-my-gosh-there-is-no-way!!!! I'm on V0!!!!!! Same premise ... you follow the color coded holds, starting on the floor in very weird awkward positions! The difference here is that once you get to the top, you have to climb back down ... which means LOOKING down to see where your holds are. EEEEKKKKK!! One more move to the top here!! You can see a bag hanging at the back of my waist in these pictures. That is a chalk bag. In order to be able to hold on to the "rocks", you dust your hands liberally with chalk (you've probably seen the Olympic athletes "dust" their hands) which not only dries your hands, but helps them stick to the holds. As you climb, you reach behind and get more powder. 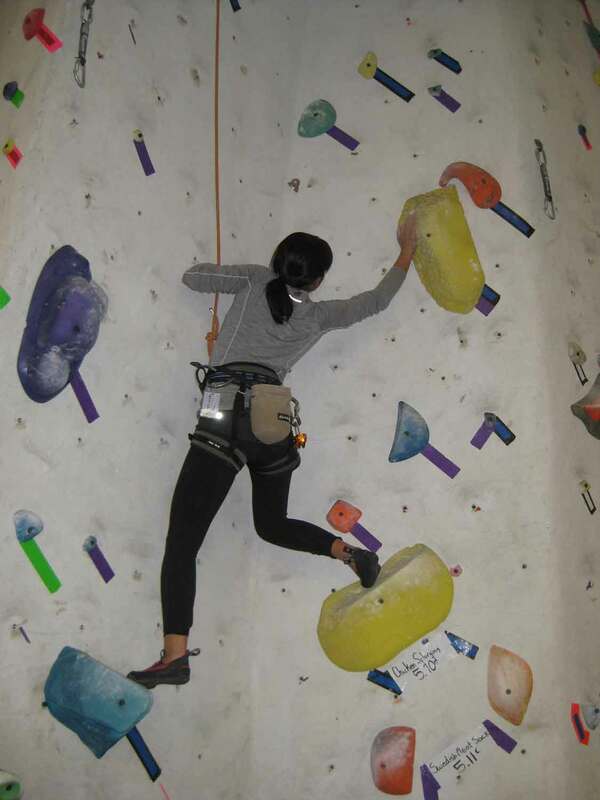 In this picture, you can see how the bag is hanging ... which means I'm climbing up a wall at a 45 degree angle. Crazy hard to do .... no, I didn't make it!! 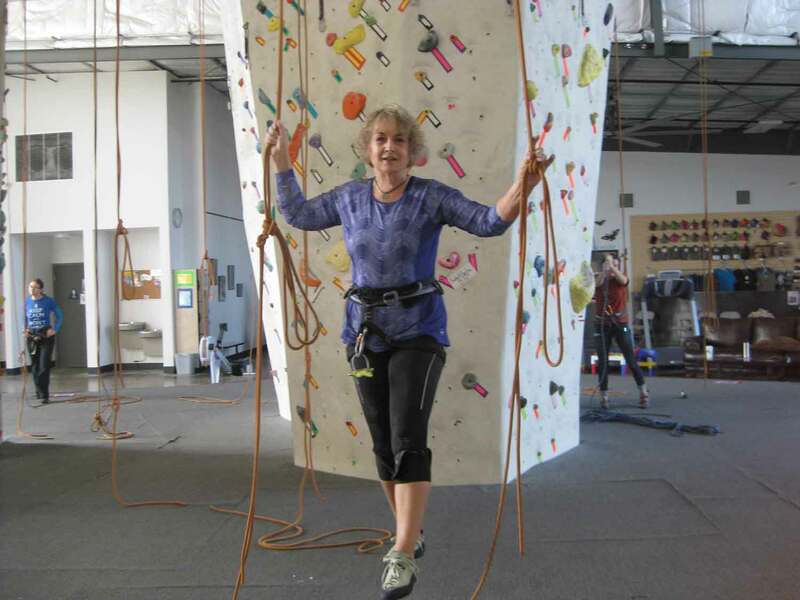 We also wear special rock climbing shoes ... extremely tight with a rubber-like sole that wraps around the foot and up the sides. Makes for good "sticking" power! !